Rocking Out in the Live Music Capital of America! 22 years into the game, , are showing themselves up time and time again with impressive performances, bringing vibrant colors and unmatched charisma to every stage they play on. With ten albums under their belt, the Portland-bred group is one of the most valued and listened to rock bands in the industry (and not just because of their awesome hair). Known for their singles “Bohemian Like You” off of their third album, Thirteen Tales From Urban Bohemia, and “We Used to Be Friends” from their fourth album, Welcome to the Monkey House, this four-piece has kept the rock realm feeling musically liberated since 1994. 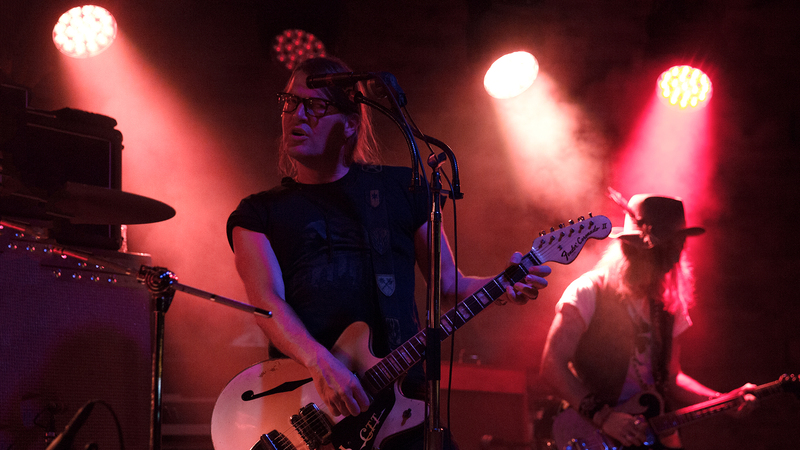 With the release of their latest album, Distortland, lead singer Courtney Taylor-Taylor, guitarist Peter Holmström, keyboardist Zia McCabe, and drummer Brent DeBoer, have set out to conquer three continents for their The Dandy Warhols Live tour. We were there at the final show of their North American leg as they performed in Austin at the Scoot Inn for the second night in a row, and it was just as awesome as you could imagine. Check out the shots we snapped, and don’t forget to track them to see when they’ll be playing in a city near near you.